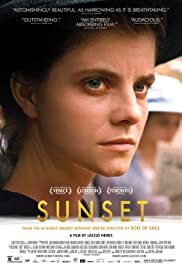 SUNSET, Hungary’s Academy Award entry for the Best Foreign Language Film 2019 is a lavishly mounted production with great attention to detail in dialogue as well as production sets, wardrobe, hair and yes, hats. One problem of the hair is that Leiter has the perfect curls throughout the film. The story protagonist is the daughter of the original owners of a established well-successful hat shop in Budapest. When the film opens, Irisz Leiter (Juli Jakab) arrives at the hat shop seeking employment as a milliner, but is turned down. Director and co-writer of the script Names already won an Oscar for Best Foreign Film in 2016 for his Jewish concentration camp drama, SON OF SAUL. Watching SUNSET immediately brings to mind the similarities of both films despite its different settings. What is most notable is Nemes’ fondest of keeping the camera at neck level of his main character and the story unfolds as if seen from the character’s point of view. In SUNSET, the camera also reveals, while at neck level, Leiter’s collar of her period dress as well as her hair and of course, stunning hat. Every line of dialogue appears to be carefully written with subtle innuendoes often found in many of them. This technique does get tiresome after a while. Clues to the story and Leiter’s history are also revealed in the dialogue. Example: when Leiter tells a stranger who inquires the reason of her sadness, she says: “I just got turned down from a job at the hat company.” “That is not the only hat company in town,” is his reply to which she retorts: “But it is the only one with my name on it.” The film’s best line: “the horrors of the world (at the brink of the first world war) hides behind these infinitely pretty things (referring to the hats). The story is set in thriving Budapest in the early 1920s. It is before the first world war when the Austro-Hungarian was the centre of Europe. Besides the wealth on display in Budapest, poverty still exists. When Leiter returns to her boarding house after being rejected from her job, she is told she is returning to dust and bed bugs. The story is about Leiter leaving the orphanage and finding out the secrets of her family. Leiter was put in the orphanage at the age of 2 after her parents’ death. She does not remember anything. She learns of a brother, who had committed crime and now presumed gone into hiding. Her re-appearance at the hat shop generates fears and memories of her brother’s evil deed. But Leiter is determined to learn the truth surrounding her brother and keeps inquiring despite very bad vibes from those she asks. The twist in the story occurs around the half way mark in the two-hour over film. For what the film is worth, the period atmosphere and setting are extremely well done. The narrative fails to satisfy in what would have resulted in an outstanding film.